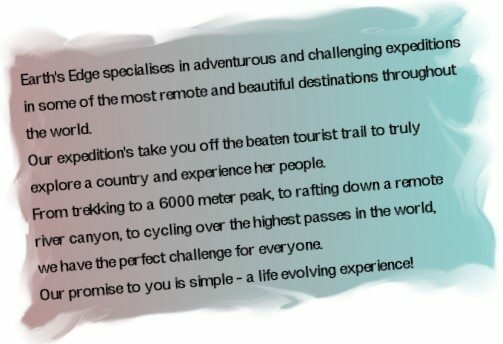 Earth’s Edge Adventure Challenges 2012 announced. Come along to one of our FREE info nights. Over the coming spring, we at Great Outdoors will be hosting a series of FREE information evenings in conjunction with Earth’s Edge. All the talks will take place upstairs in the main store on Chatham Street at 7.00pm on the designated dates. The subject of each talk is listed below, follow the links for more info and to book some FREE seats. There will be special offers & discounts relevant to each subject available for all those in attendance. Ugandan Tri-Challenge – Wednesday, February 15th. Mount Elbrus – Monday, February 27th. Indian Himalayas – Monday, March 5th. Kilimanjaro – Monday, March 12th. Great Wall of China – Tuesday, March 21st. Aconcagua – Tuesday, April 10th.